Treat your new vehicle with the very best in ceramic paint coating protection, this can also be applied to used cars. After fully preparing your vehicle with full decontamination process and single stage machine polish I will apply the 9H ceramic paint coating protection to insure your vehicles paintwork is fully protected from the elements. With having the hard wearing Ceramic Paint Coating Protection applied to your car it will increase the resistance to light scratches and etching from harsh chemicals. The ceramic paint coating protection treatments that DMD Detailing provide form a permanent film, unlike car waxes and becomes the paintworks new outer layer, adding more gloss and providing durable paint protection. The Ceramic Paint Coating Protection DMD Detailing use will outlast any dealership coating & protect the clear coat and base colour from ultra violet rays and acid rains, preventing them from degradation and colour fading. The painted surface with the ceramic paint coating protection will continue to look glossy years later. Besides that, dirt, road film etc find it difficult to get stuck on the surface compared to a carnauba wax due to the super hydrophobicity of the ceramic coated surface. Enhances Gloss levels, even on new vehicles! 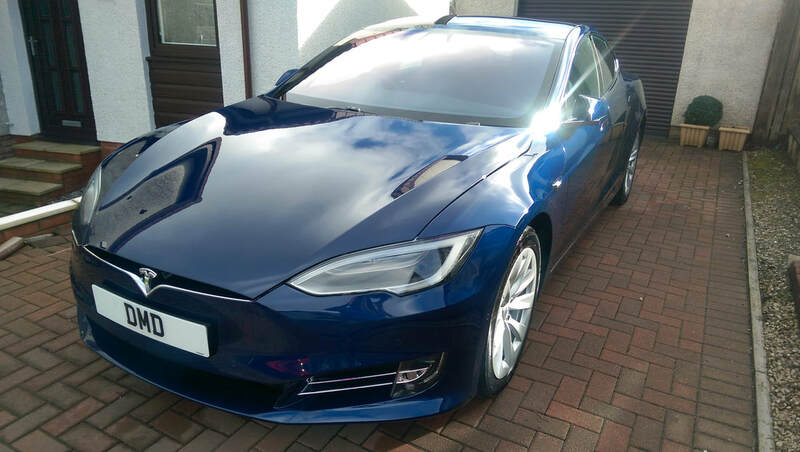 Tesla Model S after my 9H Ceramic Paint Coating Protection treatment. DMD Detailing have a solution to this problem with my Ceramic Paint Protection Coating Treatment. The 9H ceramic paint coating protection for cars is a transparent liquid that when cured to a surface, transforms into a transparent ultra hard glass film. This film acts as a permanent barrier between your vehicle and exterior elements that damage paint over time. The 9H ceramic paint coating is a new generation of paint protection technology. It outperforms and outlasts older products like wax, sealants and paint protection films (PPF). 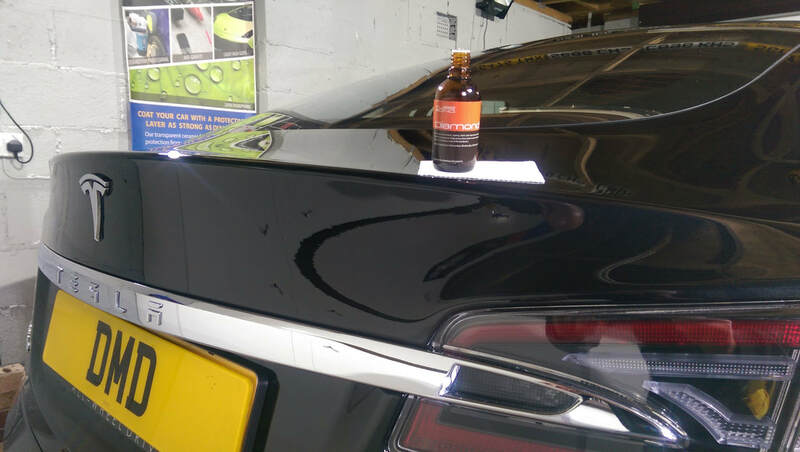 Unlike the older generation of paint protections like wax and sealants, the 9H ceramic paint coating protection forms a permanent bond with the coating of your Tesla Motors paintwork which can only be removed by machine polishing. This makes it extremely durable and reduces the need for constant reapplication. I offer 3 packages for my 9H Ceramic Paint Coating treatment. Ceramic Paint Protection Inverclyde, Ceramic Paint Protection Renfrewshire, Ceramic Paint Protection Glasgow, Ceramic Paint Protection Paisley, Ceramic Paint Protection Renfrew, New Car Paint Protection Glasgow, New Car Paint Protection Renfrewshire, New Car Paint Protection Renfrew, New Car Paint Protection Paisley, New Car Protection Paisley, New Car Protection Renfrewshire, New Car Protection Glasgow, New Car Protection Renfrew, Car Detailing Paisley, Car Detailing Glasgow, Car Detailing Renfrew, New Car Protection Package Paisley, New Car Protection Package Glasgow, New Car Protection Package Renfrew. Below are some of the new or pre owned cars that I have had the pleasure of working on and had ceramic paint coating protection treatments.